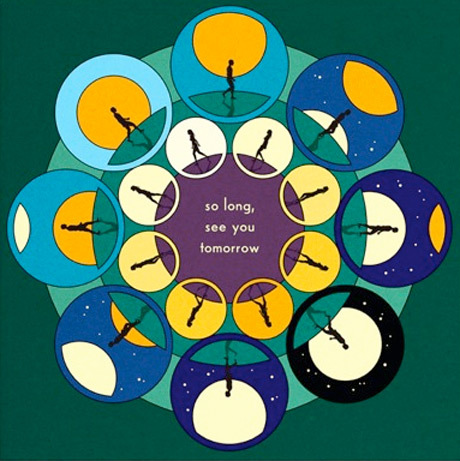 When Bombay Bicycle Club first arrived on the scene way back in 2006 as contestants on the popular Road to V British reality series, they seemed like nothing more than a better than average college rock band (this was a group named after a chain of Indian restaurants, after all). But ever since their Jose Gonzalez-inspired folk foray in 2010 — the criminally underrated Flaws — the band has sounded less and less like themselves on each subsequent record. Buoyed by frontman Jack Steadman's ever increasing interest in the world of IDM and downtempo electronica, BBC's fourth studio album, So Long, See You Tomorrow, finds the band saying goodbye to the plucky guitar chords and reverb-heavy riffing that still anchored them to the world of rock'n'roll on 2011's A Different Kind of Fix and picking up an array of samplers in their place. Starting off with cinematic album opener "Overdone," chills set in early on BBC's newest record thanks to sinister lead single "Carry Me" and MPC workout "Home By Now." Picking up after the meandering "Whenever Wherever," things really hit their stride with second single "Luna" (which seems like the response to previous touring partners Friendly Fires' call on "Kiss of Life," what with its Bollywood beats and dry delay), while "Feel" reimagines the Cure as a tribe of Middle Eastern nomads.